Warner Bros. Home Entertainment provided me with a free copy of the DVD I reviewed in this post. Technology when I was in school consisted of typewriters and only 1 computer in the math class. Nowadays kids have so much technology available to them. Whether it is computer class, yes, a whole classroom of computers, or cell phones or all the new technology available to them through the “Smart” boards instead of chalkboards, kids have so much more available to them for learning. 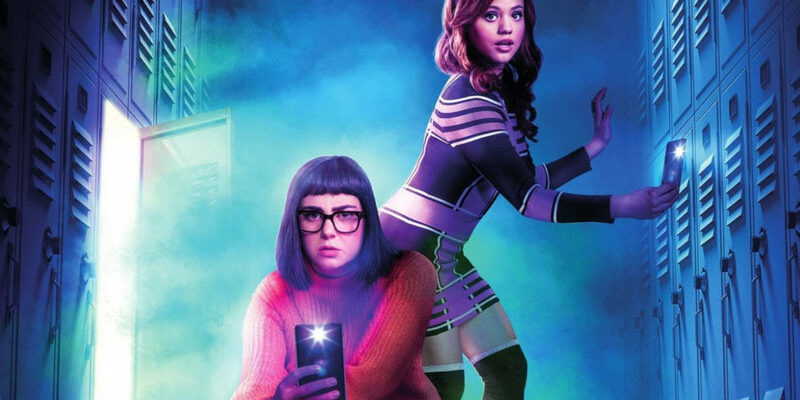 Technology and Girl Power really make the Daphne & Velma Movie exciting for all ages. 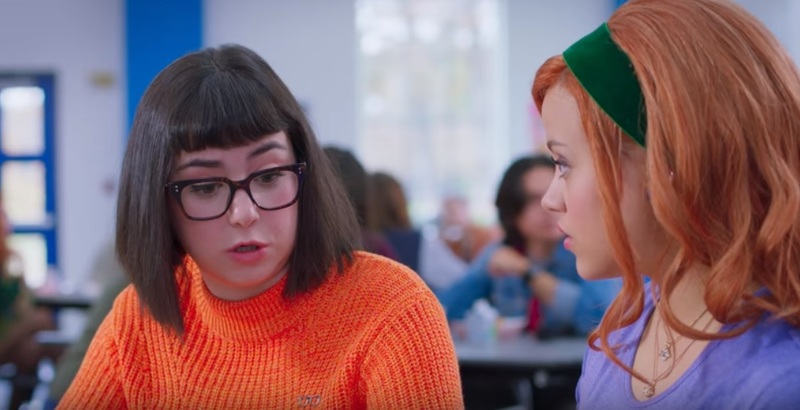 I had the pleasure of sitting in on an interview of Sarah Gilman, who plays Velma in the all new live action prequel film, Daphne & Velma. She was so sweet and had great answers to all the questions that were asked. 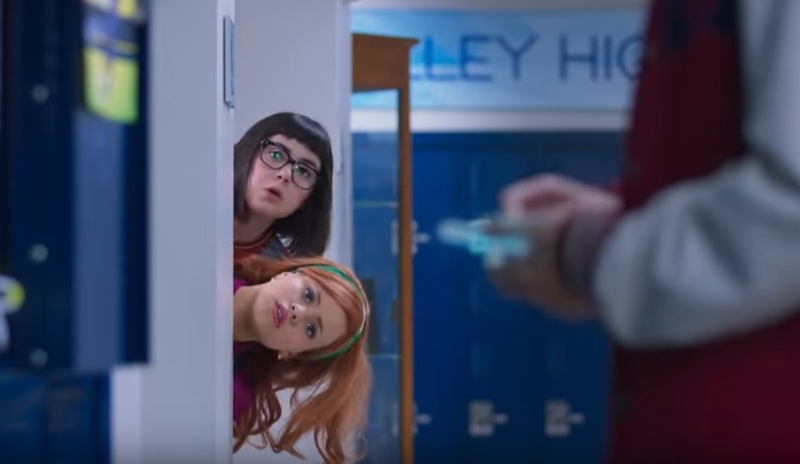 Ridge Valley High is an innovative center of learning for some of the brightest minds in the nation, including both Daphne Blake (Jeffery) and Velma Dinkley (Gilman). 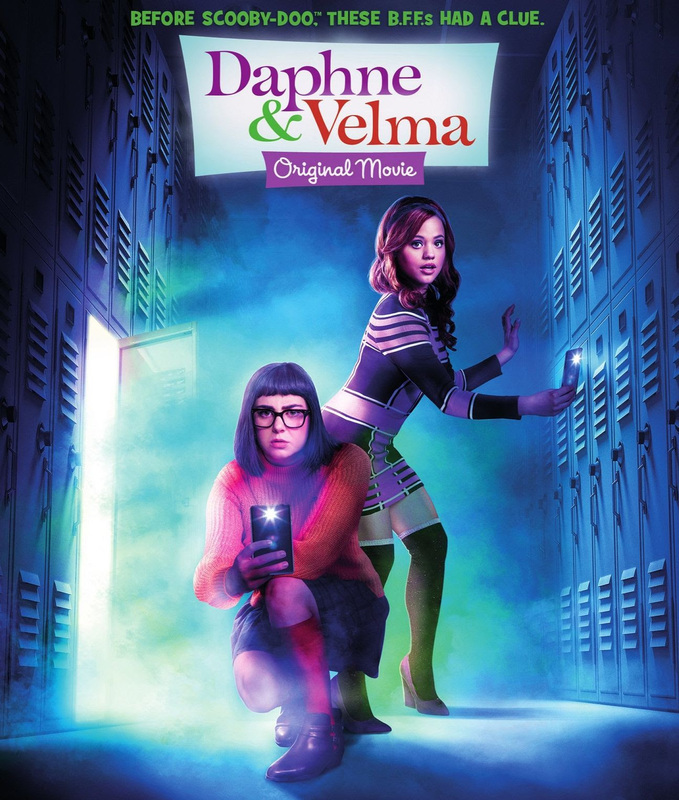 Together, the best friends discover a number of questionable disappearances on campus as kids who were once full of life appear to become “zombified.” The mystery brings Daphne and Velma together to see if they can solve the case. Heidi – Thelma is a practical thinker, and her outfits reflect that, what is the one thing you want all girls to take away from the film? Sarah – Oh, uh, just in general, or related to the clothes? Heidi – Either way is fine. 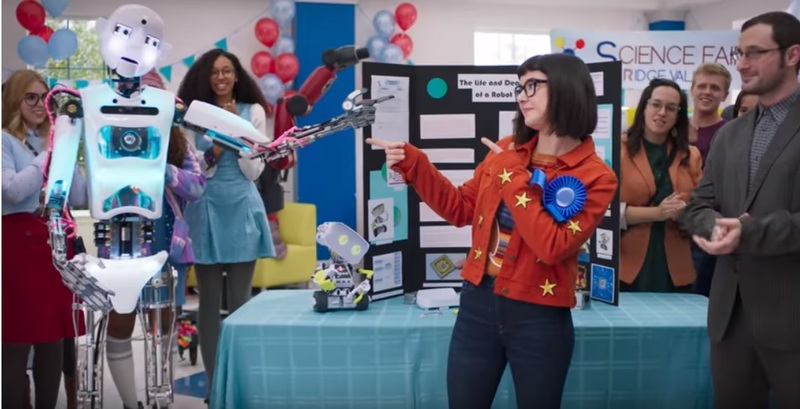 Sarah – Oh, ok, um, I think in turn what I want girls to take away from this film is that you know you have to put most clearly and short girls can do anything, just period, like girls can do anything guys can do, girls can do anything period. 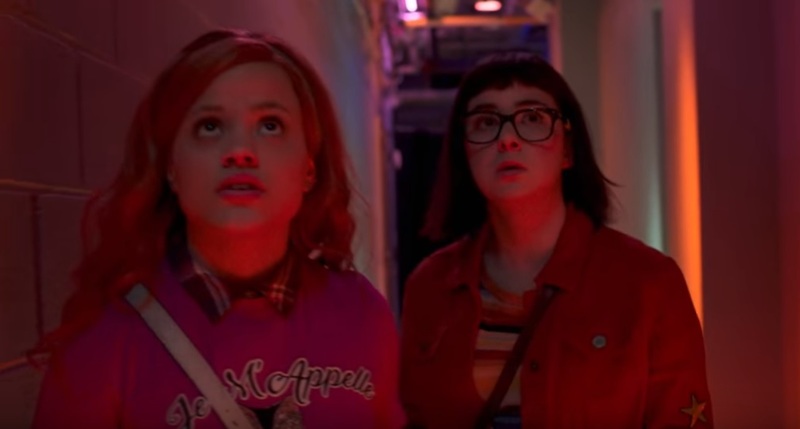 I think that this is a really good film in that it shows 2 strong young females that aren’t you know constantly talking about boys or damsels in distress waiting for someone to rescue them. They are proactive, and they are fast thinking. And they are very real characters. They’re scared and times and find that inner strength and inner courage to keep moving forward and find they’re own destiny. And I think that is a really important message to be in the media right now in young females because historically we haven’t seen much of it and so I’m hoping that’s a strong message that young females and really anybody watching the movie can take from this film. Ellen – Hi Sarah, I was wondering are you or were you rather a fan of Scooby Doo when you were younger and if so, who was your favorite character? Sarah – Hi, um yes, I was to put it very short and punctual. Yah, I was a big Scooby Doo fan. I was probably I think on the end of the generation that watched the original cartoon. So that’s the one I grew up watching, the original, and I was watching it Saturday mornings, I was watching it before school, I was watching it kind of all the time. And, so my favorite character was either Velma or Shaggy. Because I thought that those two were always solving the mysteries, and at the same time, they’re the ones that made me laugh. They were like the sassy funny ones and the silly goofy ones. 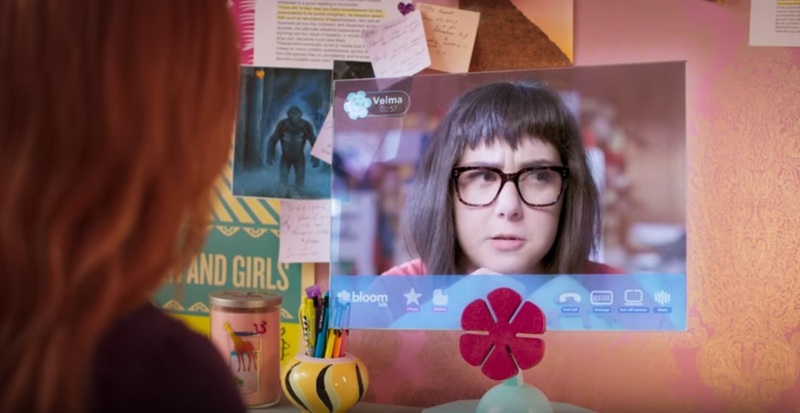 So definitely a Scooby Doo fan, definitely a Shaggy, Velma fan. Jennifer – Hi, um, do you have a favorite moment from just like the hijinks behind the scenes on set that you would like to share with us today? Sarah – Yah, um, so we were shooting in a real high school um, for almost the entirety of our shoot and so it was operating during the day and when school got out we would come in with all our equipment and film from maybe like 5 pm – 5 am the next morning and so people were getting kind of delirious and tired and dare say cranky at points and um so Sara and I, that played Daphne, Sara Jefferies, and I would run around and just kind of like check in with everyone and run up and down the hallways. We’d get really, we’d go drink coffee and then, Sara’s very sensitive to coffee and I just have an exuberant personality in general. And so we got really hyper really quickly, so when everyone else was just like starting to get a little sleepy, we just run up and down and start making noises and check in on everyone. So there weren’t like a lot of pranks done on set because everyone was working so hard all the time there really weren’t any things like that went wrong so it was a pretty like tame set in that respect, but we definitely had a good time running around. Another one that I like was that we were staying in a hotel where a lot of basketball teams frequented, and so Sara and I would at points just go sit in the lobby and make it look like we were waiting for someone in case some basketball players walked by and we could scope them out. So that’s kind of my two favorite funny moments from set. I really enjoyed this movie and love all the “Girl Power” that was present throughout the whole movie, including the director, producer and more. Want a free copy of the movie? Just enter the contest below. Even if you don’t win, you will really enjoy this move, so be sure to see it.